I spent a year abroad n the mid-Nineties, backpacking around the world. We headed east, through India and the South Pacific, and ended up in New Zealand, then Australia, and then across the ocean into the Pacific Northwest of North America, to Vancouver, Seattle and Portland. This journey around a big chunk of the Pacific rim introduced me to coffee as a serious subject, something more than the instant rubbish we’d drunk at home in Britain. Each of these countries had an exploding coffee culture, and people were starting to take coffee very seriously indeed. When we got to Seattle in particular, we found a city that seemed to be almost entirely fueled by this mysterious bean … there was a whole industry and a culture there that simply didn’t exist in Britain. I remember sitting in a coffee shop in Capitol Hill pondering that this sort of thing could really work in the UK, and of course, I turned out to be correct, not that I had any hand at all in making it happen, apart from enthusiastic support for the first wave of big chains that sought to emulate the Starbucks experience, and later, a more refined appreciation for many of the independent places that have started to crop up around here in recent years, in the wake of the chains’ success. It’s a mysterious thing, this dark, powerful drink, and everything that goes with it. There’s a certain aura around those who make it, a sense that this is not something that can be done by just anybody, a sense that these people, these baristas, are experts in their field and should be left to get on with what they do, and I’ve believed this for years … I can’t make coffee at home as well as the best independents can, with their expensive espresso machines and their wealth of knowledge. And this is the real point … brewing coffee is a science. It’s a process that can be explained and reasoned in clear, logical terms, but it’s more than that … there’s an art to it too, an art in knowing which of the thousands of variables to tweak to make that shot of espresso perfect, or to make the milk in that latte as smooth as silk. It’s an art, and not everybody can do it. I’ve got to know quite a few baristas in and around Leeds over the last couple of years, and also people like Nino from Casa Espresso, a wholesale supplier of beans and coffee-making equipment to many of the cafés , restaurants and coffee shops around West Yorkshire. The more I’ve thought about it, the more I’ve realised that companies like Casa Espresso are the real backbone of the coffee industry in West Yorkshire, and are responsible in large part for raising the standard of coffee around here through three things: beans, gear, and training. Neither one of these is more important than the other, but without all three, you’re going to get a really bad cup of coffee. Good beans are vital, good equipment is essential, but it’s proper training that bridges the gap between the two, and that’s exactly why Nino provides exactly that alongside coffee and equipment. I’m an enthusiastic amateur when it comes to coffee. I’ve learnt a few things along the way, and I’ve watched people make hundreds and hundreds of drinks, but I’ve never been trained or had the process explained to me in detail. Of course, when Nino idly asked me if I fancied coming along to one of his training sessions, I couldn’t take the day off quickly enough. The sessions were led by Paul Meikle Janney, a thoroughly knowledgeable and infinitely patient trainer, who runs a training and consultancy business called Coffee Community. The day was split into two halves – a session covering the basics of operating an espresso machine properly, from grinding, through to making shots of espresso, up to foaming and steaming milk for staple drinks like lattes and cappuccino, and another session on latte art, instruction in how to make the beautiful hearts and rossetas that sit on top of many milk drinks. A good barista makes this look easy, effortless, but it isn’t. It’s actually one of the trickiest things I’ve ever done, something that only clicks with practice, pour after pour, gallon after gallon of milk. 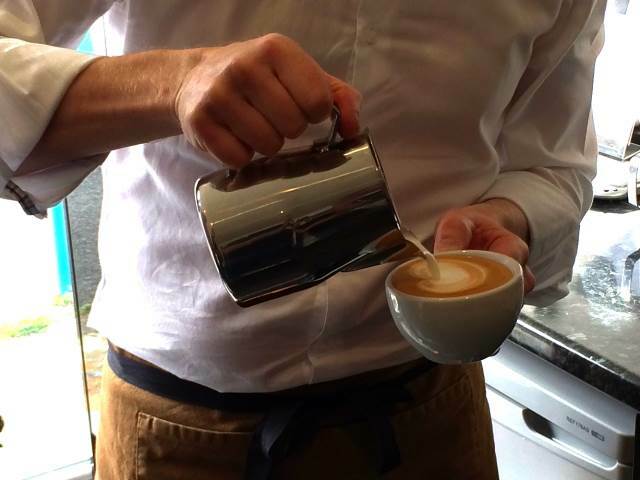 Standing there with a jug of foamed milk in one hand and a cup of espresso in the other, having watched an expert pour a perfect heart, and copying those actions, those simple pours and tilts, was incredibly difficult. It’s about muscle memory, apparently, about just instinctively knowing what to do and when, about getting over the tension that rises in your arm and shoulder as you, very simply, just think about it too much. 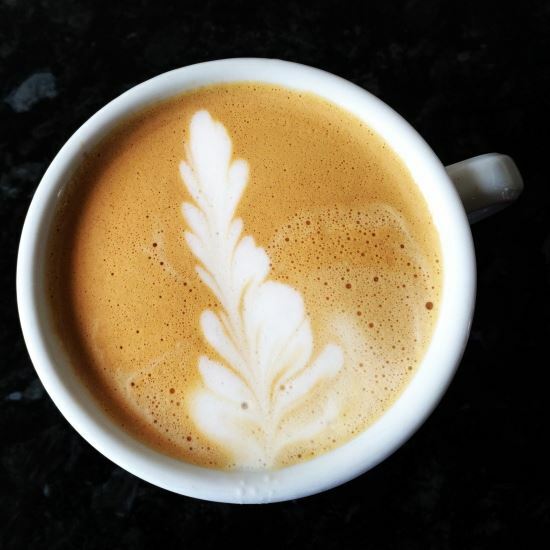 It all sounds a little Zen, but pouring a good latte is about just letting go and doing it. All of that’s very hard, but after only a couple of hours of practice, and about eighty drinks down the sink, I was starting to make patterns that were, well, vaguely discernible. My best attempt came when I crept into the corner of the training room, and hid behind the glass door. I managed to shake away some of the tightness in my arm, and had the milk at just the right consistency, and I just poured it into the cup, with a couple of flourishes. It was nowhere near Paul’s standard, but it was a huge achievement for me. I felt like I was getting there, and I was very proud of that wonky rosseta you see up there at the top. It was enormously satisfying. I think Paul thought that I was getting somewhere, too, from the smile on his face as I spotted him watching me through the open glass door, careful not to break my flow, and that’s the sign of a very good trainer – knowing when to support, and when to step back and just watch, and Paul did that superbly all afternoon, as we tried, failed, tried again, succeeded, failed, improved, all with his encouragement and guidance. I realised later, talking to Nino, that these types of sessions, which Casa Espresso offer to their customers as a matter of course, are one of the most important things they do, and it’s clear that both Nino and Paul believe this. 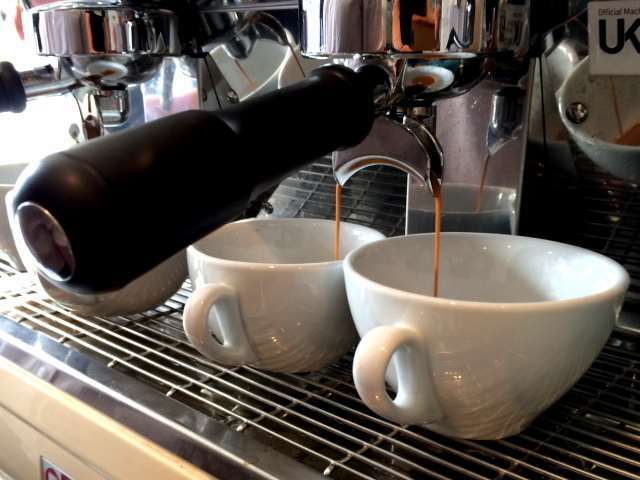 An espresso machine is a complicated beast, and making even a simple latte, and making it well, requires a high degree of understanding of the process, the equipment and the reasons behind why things are done a certain way. Nino was clear that his business is in the business of supporting its customers, because unless his clients understand what they’re doing, that £7,000 worth of espresso machine is nothing more than a very, very expensive ornament (we trained on a £7,000 San Remo Verona TCS, and it’s one of the most stunning pieces of coffee-making equipment I’ve ever seen. Sadly, I don’t have room for one at home). The main thing that I learnt form Nino and Paul was that making coffee is about detail and understanding. It’s about using the right equipment in the right way, with the right quality of product, and doing it with care and passion. Small tweaks borne of better understanding can improve the result infinitely, because, after all, who wants to run the café or restaurant with all the gear, but no idea? In Casa Espresso, I saw a family run business with a heart, and a commitment to its customers, a commitment that leads to them making every attempt possible to improve the quality of the coffee their customers serve. And that’s a very good thing for everybody.